Tag Archive | "Right to a Healthy Environment"
The basic premise is that everyone deserves to live in an environment that does not harm their well-being and provides an adequate standard of living. Currently, the right to a healthy environment is not one that is internationally recognized as a human right. There are skeptics that claim that the environment and human rights are two separate issues, but the two are actually interconnected. A healthy environment is the foundation for recognized human rights, such as, the right to life and an adequate standard of living. Without a healthy environment, these rights cannot be protected. The first international agreement recognizing the right to a healthy environment is the 1972 Stockholm Declaration. Since then, there have been numerous international and regional agreements, as well national legislation that have supported recognizing the right. Most of these sources elaborate on the idea of the environment and human rights being inseparable. Over the past 30 years, the awareness of the degradation of the environment due to human activity has become a serious concern for the international community. Human impact on the environment has always existed, but has drastically increased since the 1980s. Since the Stockholm Declaration in 1972, there have been many international agreements that have been created for the purpose of protecting, preserving, and improving the environment for human well-being. According to the Register of International Treaties and Other Agreements in the Field of Environment, there are 272 treaties and international agreements dealing with the environment and environmental obligations. 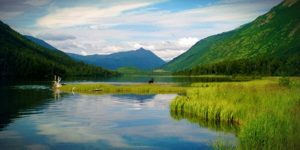 Each of these treaties and agreements has helped develop international environmental law and have helped shape the right to a healthy environment. There are many constitutions and laws around the world that recognize this right. The benefit to having a right enshrined within a constitution is similar to the benefits of having a treaty. A constitution is legally binding and holds the government accountable to meeting all the rights sets out within it. By having the right to a healthy environment in the constitution, it will lead to stronger environmental laws and gives governments improved means to implement and enforce the right. There is an inherent link between human rights and the right to a healthy environment, because they are dependent upon each other. When the environment is not being taken care of the right to life, health, work, and sanitation are negatively impacted. People are dependent upon the environment in order to live, in a way, a healthy environment is the foundation for many other human rights. By taking care of the environment we are protecting human rights and vice versa. The recognition of this right can be seen by the increasing number of states with constitutional provisions as well as the amount of international agreements on the right. Since the Stockholm Declaration, the discussion surrounding the right to a healthy environment has changed drastically. With more scientific information available and concerns about sustainability becoming more prevalent, the right is being given more consideration internationally. There are countless binding and non-binding international agreements as well national constitutions and legislation that guarantee canadian casino news the right. Not only are states recognizing the right, they are also recognizing that the environment and human rights are interconnected. In sum, the right to a healthy environment is critical not only for the sustainability of the global environment, but also for the protection of many human rights. Courtney Burgess is a 3L at the University of Denver Sturm College of Law and is a staff editor on the Denver Journal of International Law and Policy. Declaration of the United Nations Conference on the Human Environment, U.N. Doc. A/CONF.48/14/REV.1 (1972). Register of International Treaties and Other Agreements in the Field of the Environment, U.N. Doc. UNEP/Env.Law/2005/3 (Dec. 30, 2005). David R. Boyd, The Constitutional Right to a Healthy Environment, Environment (Jul.-Aug. 2012), http://www.environmentmagazine.org/Archives/Back%20Issues/2012/July-August%202012/constitutional-rights-full.html. John Knox, Special Rapporteur on Human Rights and the Environment (Former Independent Expert on Human Rights and the Environment), United Nations Human Rights Office of the High Commissioner, http://www.ohchr.org/EN/Issues/Environment/SREnvironment/Pages/SRenvironmentIndex.aspx.